Dark, powerful, highly-expressive aromas of brilliant purity and deep nuance. Wild berry, cassis, and black cherry followed by woodsy complexity, wild mint, bay laurel, and sweet truffle. Deep, plush mouthfeel is supple and full. Red and black cherry liqueur, crème de cassis, clove, and cocoa. Layer upon layer of ripe fruit extract completely buffers the prodigious mountain tannins. Comes into focus in the glass, becoming linear with sleek acidity and lingering cocoa nib flavor. Drink after 2019. 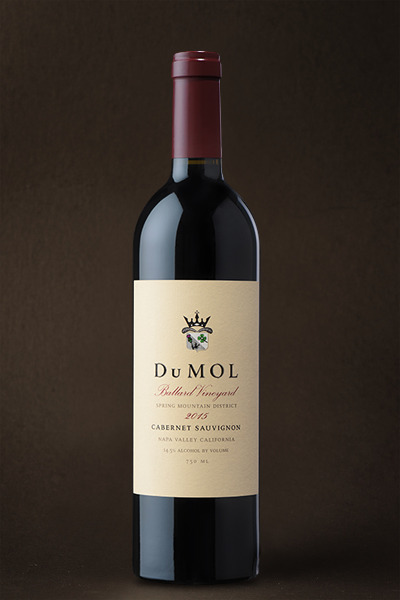 From a mountain-top meadow hidden in the forest comes the winemaking team’s favorite Cabernet of the vintage, a wine for those with patience, those willing to work a little harder for a greater reward. This wine is our near-perfect vision of what organically-farmed, small-lot, Spring Mountain Cabernet can and should be. Starting out plush, deep, and layered then gradually shifting to earthy and complex, only to finish chewy, sinewy, and youthfully taut. When we set out to make single vineyard mountain-grown Cabernet, we had this style exactly in mind. The wine gradually unfurls its deep complexity then tightens slightly once more, not giving too much away, hinting at what rewards lie ahead with time in the cellar. This bottling represents our favorite six barrels of the vintage. The balance makes a critical contribution to the Napa blend, so there’s not much to go around, but it's a wonderful expression of proper old-school Cabernet that can age for 20+ years. Don’t miss this wonderful bottling.